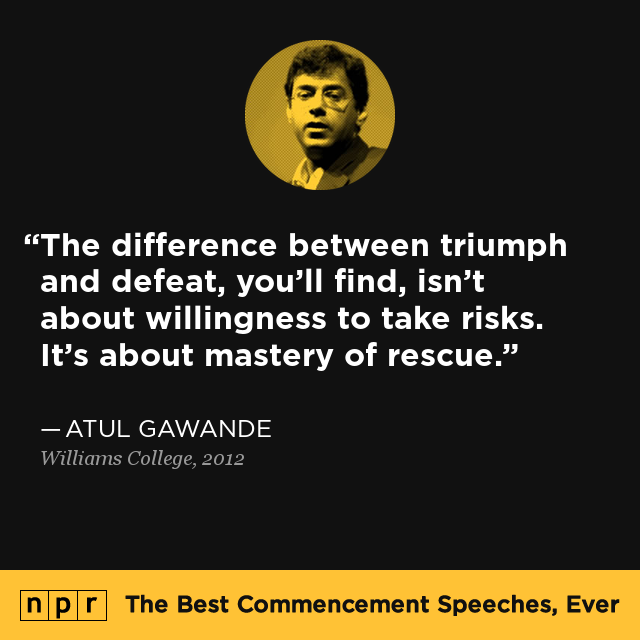 What We Learned From The Best Commencement Speeches Ever : NPR Ed Our new searchable database of commencement speeches brings you more than 300 of the best, tagged with the most enduring themes: Work hard. Change the world. And, of course, YOLO. 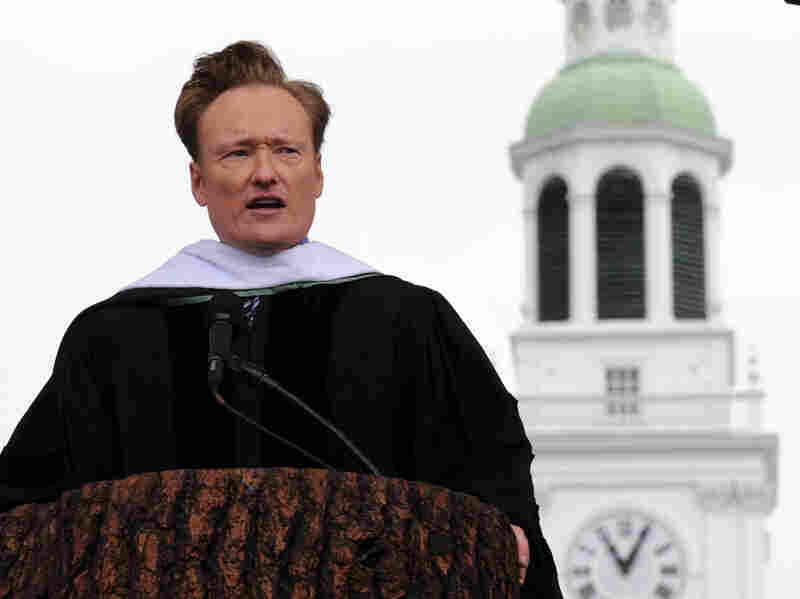 Conan O'Brien's 2011 commencement address at Dartmouth College was one of those speeches that was so good it drew news coverage. Something funny has happened to the familiar commencement address in the past 10 years. That something is YouTube. Steve Jobs' 2005 address at Stanford, to take just one example, has been viewed upwards of 20 million times. We are now in a golden age of the commencement speech as a hilarious, inspiring form of popular art. 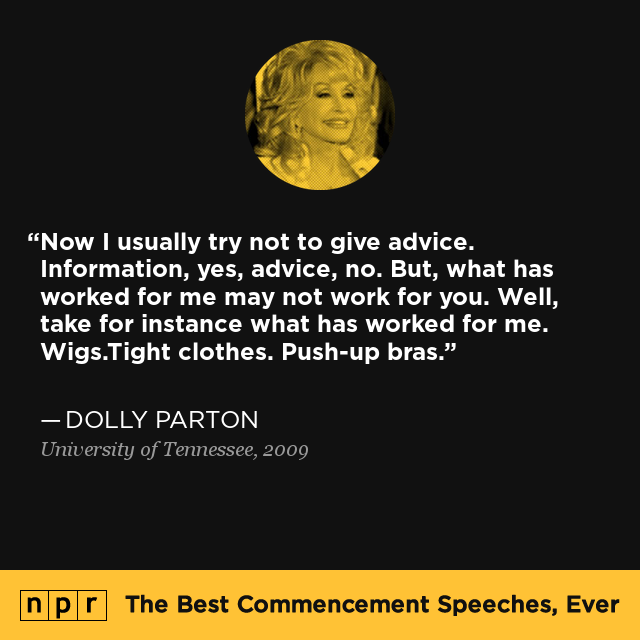 And to pay our respects to graduations past and present, NPR Ed and the NPR Visuals team have built a searchable, shareable database of over 300 commencement speeches dating back to 1774. Since the colonial era, young graduates in stiff gowns and itchy mortarboards have been forced to sit through this one last lecture. On rare occasions, politicians have used commencements to say important things, like John F. Kennedy announcing a nuclear test ban. Other lucky graduates have been treated to profound musings by literary geniuses like Joseph Brodsky and Kurt Vonnegut, or calls to action by activists like Gloria Steinem. Today, like so much else, the format has become dominated by celebs — the Conan O'Briens, Meryl Streeps and Amy Poehlers. But commencement speeches still make news, and like those by the late David Foster Wallace and the great George Saunders, they can still be poetry. To help you explore this history, we tagged every speech with a few words that express its theme or take-home message. Here is a countdown of the dozen most popular tags — a tweet-length guide to life. Click on any tag to view all the corresponding speeches in our app. Kindness has gained currency in the 21st century; it's equally popular among CEOs, creative types and Mother Teresa. "Err in the direction of kindness," as author George Saunders told Syracuse in a wildly popular 2013 speech that has become a whimsical animation and a book. YOLO (an acronym for "you only live once") is the new "Carpe diem." Stephen King, the horror writer, got unusually specific at Vassar in 2001, asking the class to picture their inevitable deaths. "What will you do?" King asked. "Well, I'll tell you one thing you're not going to do, and that's take it with you." This message isn't just for art schools. "Art is love," said Yoko Ono to the Maine College of Art in 2003. Enough said. "I'll know we're getting someplace when as many young men as young women ask, 'How can I combine career and family?" Gloria Steinem told Tufts in 1987. Work-life balance didn't pick up as a theme until the 2000s, and women (who make up 27 percent of our database) are still about a third more likely to mention it than men — sorry, Gloria. "Dream" speeches are about putting passion ahead of the practical, a curious admonition for people bearing an average $29,000 of debt for their degrees. Pleading with graduates to devote their lives to saving the planet at the University of Portland in 2009, environmentalist and author Paul Hawken said, "The most unrealistic person in the world is the cynic, not the dreamer." Ironically, the popularity of history has fallen over the years. It appears in almost all the speeches before 1975, and a much smaller proportion of the speeches since then. One of my favorites is by suffragist Carrie Chapman Catt, who in 1936 gave the women of Sweet Briar College in Virginia a recap of the "Woman's Century," with gains in property rights, education and, of course, the right to vote. By definition, commencement speakers are conventionally successful, so telling stories about failure establishes their humility. You never hear about embracing failure from, say, a Bernie Madoff. In 2011 Conan O'Brien was coming off a bumpy stint hosting The Tonight Show. He gave Dartmouth a surprisingly heartfelt speech about that experience, though still with lots of jokes: "Nietzsche famously said, 'Whatever doesn't kill you makes you stronger.' But what he failed to stress is that IT ALMOST KILLS YOU." Businesspeople like to deliver this message, but so do creative types. CNN's Anderson Cooper told Tulane in 2010 about sneaking into Burma with a fake press ID, sleeping on rooftops and dodging bullets to become a freelance war correspondent (glossing over the role of his family connections and good looks). Not giving up is kind of like the opposite of embracing failure, and it's marginally more popular. "Be tenacious, be irrepressible," said Microsoft's Steve Ballmer in 2011 to the University of Southern California. There's something so distinctively American about the advice to ignore others' advice. Ralph Waldo Emerson used his 1838 address to the Harvard Divinity School to articulate his radical, mystical humanism. Truth, he says, is available to everyone, but "cannot be received at second hand." His indictment of organized religion was called "distasteful" by leaders of the church, but his message — "The imitator dooms himself to hopeless mediocrity" — rings strongly to modern ears. Some of the most popular speeches throw all the spaghetti at the wall: a laundry list of tips, like the "wear sunscreen" speech (really a 1997 Chicago Tribune column by Mary Smich) attributed wrongly to Kurt Vonnegut. In 2013, for example, New York Times columnist David Brooks advised Sewanee's graduating class, based on research, to "Join a club that meets once a month. That produces the same happiness gain as doubling your income. Use what money you have to buy experiences, not things. Don't try to control other people; you can't. Don't ruminate on bad events." And the No. 1 most enduring message of all time to graduates? When accomplished people come face to face with talented youth, they offer this advice about a third of the time: Do as I did. Make your mark. Wangari Maathai, an environmental and peace activist, gave a classic change-the-world speech at Connecticut College in 2006, two years after she received the Nobel Peace Prize for her work founding the Green Belt movement, which planted tens of millions of trees. "We need to work and to develop cultures of peace, and cultures of peace require that we learn to listen to each other." For more speeches on each theme, and to see the rest of the 16 tags we picked, go to our app at The Best Commencement Speeches Ever. And tell us your favorites!